According to the Bruichladdich Blog some oil was finally delivered on Monday and Tuesday, but the underlying problem is far from resolved. In short the new Bruichladdich Pier is unfit for purpose and creates all all kinds of concerns and issues. Read the Bruichladdich Blog entry for some background. Quite worrying to read. I'm sure I'll post a follow up entry once there are further developments. On a much more positive note a few more pictures: Lauren and Davoud have just returned from a visit to Islay. You can read about the visit on Lauren's blog words stick, they were on Islay for part of the festival. As of writing this there are two entries, although I think there will be more. day two - three ferries and an island and day three are online so far. For even more pictures try Davoud's Flickr photoset Glasgow - Islay - Lake District, which nicely leads me back to this weeks Friday Islay picture. 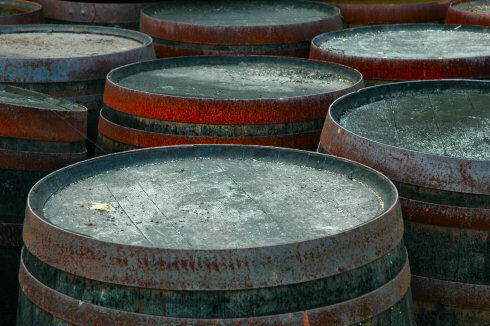 I'm not entirely sure if they are the same casks, but he also took pictures of casks at Ardbeg distillery.